In 1965 the U.S. Navy began studies for a missile in the 45 km (25 nm) range class for use against surfaced submarines. The name Harpoon was assigned to the project (i.e. a harpoon to kill "whales", a naval slang term for submarines).The Harpoon was introduced in 1977 after the sinking of the Israeli destroyer Eilat in 1967 by a Soviet-built Styx anti-ship missile from an Egyptian missile boat. Initially developed as an air-launched missile for the United States Navy P-3 Orion patrol aircraft, the Harpoon has been adapted for use on U.S. Air Force B-52H bombers, which can carry up to 12 of the missiles. 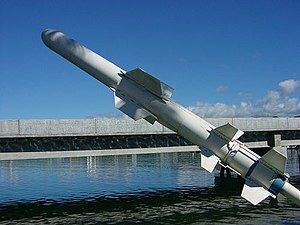 The Harpoon missile has been purchased by many American allies, especially by the NATO countries, as well as Australia, Japan, Pakistan and South Korea, among others. The Harpoon has also been adapted for carriage on the F-16 Fighting Falcon, in operation with the U.S. Air Force, Singapore, South Korea, Taiwan, and the United Arab Emirates. It has been carried by several U.S. Navy aircraft, including the P-3 Orion patrol plane, the A-6 Intruder, the S-3 Viking, the AV-8B Harrier II, and the F/A-18 Hornet. The Royal Australian Air Force is capable of firing AGM-84 series missiles from its F/A-18F Super Hornets, F/A-18A/B Hornets, and AP-3C Orion aircraft, and previously from the now retired F-111C/G Aardvarks. The Royal Australian Navy deploys the Harpoon on major surface combatants and in the Collins-class submarines. The Spanish Air Force and the Chilean Navy are also AGM-84D customers, and they deploy the missiles on surface ships, and F/A-18s, F-16s, and P-3 Orion aircraft. The British Royal Navy deploys the Harpoon on several types of surface ship. The Canadian frigate HMCS Regina fires a Harpoon anti-ship missile during a Rim of the Pacific (RIMPAC) sinking exercise. At least 339 Harpoon missiles were sold to the Republic of China Air Force (Taiwan) for its F-16 A/B Block 20 fleet and the Taiwanese Navy, which operates four guided-missile destroyers and sixteen guided-missile frigates with the capability of carrying the Harpoon, include the eight former U.S. Navy Knox-class frigates and the eight locally built derivative of the Oliver Hazard Perry-class frigates. The four former USN Kidd-class destroyers which have been sold to Taiwan can also carry Harpoon missiles, as can the 2 Zwaardvis/Hai Lung submarines and 12 P-3C Orion aircraft. This version, under development, gives the SLAM a re-attack capability, as well as an image comparison capability similar to the Tomahawk cruise missile; that is, the weapon can compare the target scene in front of it with an image stored in its on-board computer during terminal phase target acquisition and lock on. 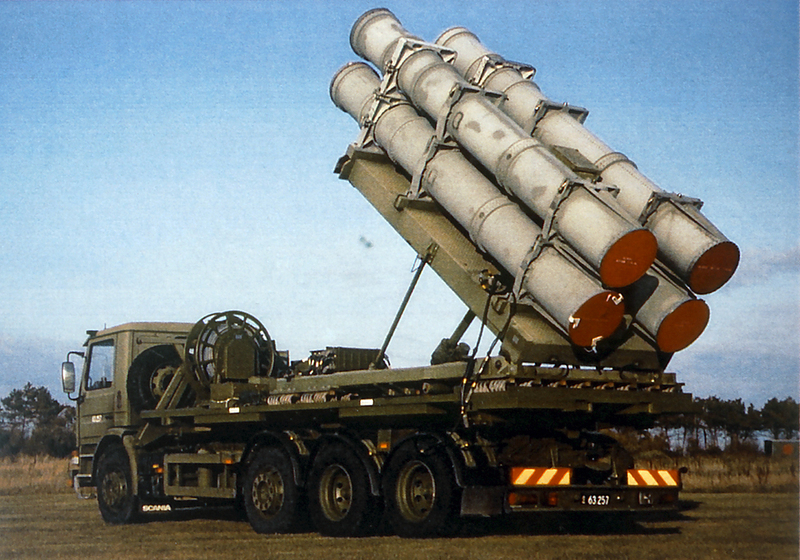 Block 1G missiles AGM/RGM/UGM-84G, and the SLAM-ER missiles are designated AGM-84H. India acquired 24 Harpoon Block II missiles to arm its maritime strike Jaguar fighters in a deal worth $170 million through the Foreign Military Sales system. In December 2010, the Defense Security Cooperation Agency (DSCA) notified U.S. Congress of a possible sale of 21 additional AGM-84L HARPOON Block II Missiles and associated equipment, parts and logistical support for a complete package worth approximately $200 million; the Indian government intends to use these missiles on its Indian Navy P-8I Neptune maritime patrol aircraft. Indian Navy is also planning to upgrade the fleet of four submarines- Shishumar class submarine - with tube-launched Harpoon missiles. Harpoon Block III was intended to be an upgrade package to the existing USN Block 1C missiles and Command Launch Systems (CLS) for guided-missile cruisers, guided-missile destroyers, and the F/A-18E/F Super Hornet fighter aircraft. After experiencing an increase in the scope of required government ship integration, test and evaluation, and a delay in development of a data-link, the Harpoon Block III program was canceled by the U.S. Navy in April 2009. Cancellation of Block III however does not preclude the possibility of continued incremental upgrades to the Harpoon missile and launching suite in the future. In 1981 and 1982 there were two accidental launches of Harpoon missiles. One from USN and one from a Danish Navy frigate (Peder Skram-class) on 6 September 1982 which ended in the recreational housing area Lumsås. The Danish missile was later known as the hovsa-missile (hovsa being the Danish term for oops). In December 1988, a Harpoon launched by an F/A-18 Hornet fighter from the aircraft carrier USS Constellation killed one sailor when it struck the merchant ship Jagvivek, a 250 ft (76 m) long Indian-owned ship, during an exercise at the Pacific Missile Range near Kauai, Hawaii. A Notice to Mariners had been issued warning of the danger, but the Jagvivek left port before receiving the communication and subsequently strayed into the test range area, and the Harpoon missile, fortunately loaded just with an inert dummy warhead, locked onto it instead of its intended target. ↑ "United States Navy Fact File: Harpoon Missile". United States Navy. http://www.navy.mil/navydata/fact_display.asp?cid=2200&tid=200&ct=2. ↑ "Directory of U.S. Military Rockets and Missiles". Andreas Parsch. http://www.designation-systems.net/dusrm/m-84.html. ↑ 4.0 4.1 "Backgrounder - Harpoon Block II". Boeing. Archived from the original on 2007-12-13. http://web.archive.org/web/20071213090034/http://www.boeing.com/defense-space/missiles/harpoon/docs/HarpoonBlockIIBackgrounder.pdf. Retrieved 2012-02-05. ↑ "Military pacts on hold but India, US continue with exercises, arms deals". The Times Of India. September 22, 2010. http://articles.timesofindia.indiatimes.com/2010-09-22/india/28238324_1_cismoa-military-pacts-joint-combat-exercises. ↑ "India to Receive AGM-84L HARPOON Block II Missiles Worth $200 Million". defpro.com. December 23, 2010. http://www.defpro.com/news/details/20860. ↑ "Navy plans missiles for four submarines". Jun 20 2012. http://www.indianexpress.com/news/navy-plans-missiles-for-four-submarines/964143/0. ↑ Time magazine. High-Tech Firepower. April 7, 1986. ↑ Ronald Reagan. Letter to the Speaker of the House of Representatives and the President Pro Tempore of the Senate on the Gulf of Sidra Incident. March 26, 1986. ↑ The New York Times. PENTAGON REVISES LIBYAN SHIP TOLL. March 27, 1986. ↑ The New York Times. U.S. STRIKES 2 IRANIAN OIL RIGS AND HITS 6 WARSHIPS IN BATTLES OVER MINING SEA LANES IN GULF. April 19, 1988. ↑ The New York Times / AP. U.S. Rocket Hits Indian Ship Accidentally, Killing Crewman. December 13, 1988. ↑ Rediff.com / PTI. Pakistan illegally modified Harpoon missile: Report. August 30, 2009. ↑ The Times of India / PTI. Harpoon missile modification by Pak very serious: US. September 1, 2009.